So how does the internet shadow pick a secure proxy, to help them move silently through the electronic highway of the internet? Well first of all shall I demonstrate an all too common process for anonymous surfing. First of all our trainee ninja will do some research, he want to be anonymous, he wants to skip through his company firewall unnoticed, hell yes he wants to use facebook in his lunch hour and twitter in his coffee break(this is how). But he can't he's tracked by ISP logs, filtered by his works proxy, censored by corporate firewalls and he's fed up of it. Knowledge and Study - the path to become a ninja proxy? Well, the study and research usually ends up with those three magic words which promise so much but deliver so very little - free anonymous proxies. This our hero will translate in his mind to mean he is using a ninja proxy (http://www.theninjaproxy.org/) which unfortunately is not completely accurate. They're free....... which is great as ninja surfer is a little short this month. They're anonymous....... again good as anonymous means nobody can see them, which is good for a ninja. They're proxies....... even better, every privacy article he read spoke of proxies. So the three magic words are typed into Google who delivers a cornucopia of lists all containing free anonymous proxies. Our ninja is almost ready to don his black hood and wield his shuriken, hiding behind his IP cloaker. The list is printed out, instructions followed for modifying his proxy settings and he's there, no longer an ordinary internet sap, he's moved into the dark shadows of anonymous internet surfing via his very own ninja proxy. Now all his web browsing details still goes through his ISP or work proxy where it is logged and recorded as usual. It then goes to an anonymous proxy which could be run by anyone, our ninja surfer has no idea who he's directing all his traffic through! It could be a nice fast university proxy, but much, much more likely it's a hacked server somewhere run by a bunch of European Identity thieves. Who knows certainly not our ninja proxy surfer, as he's carefully picked a proxy for surfing by erm selecting it from a list. So what has our Internet Proxy Ninja actually gained? Well he's probably slowed down his connection speed to about a tenth of normal (free proxies tend to get overloaded very quickly), but he has gained a little benefit. Any web server he visits will probably not be able to record his IP address (as long as the proxy is configured correctly). Security wise it's a bit like securing, barracading and padlocking a single window in your house, whilst at the same time taking off all the doors. Ninja wise - pretty much of a non starter, aspiring to be a victim of identity theft or infecting your own PC then it's a cracking idea. Seriously though you will spend half your life searching for proxies for free on the internet, some will be anonymous, some will be steal your data, all will be horribly slow. If you have any desire for anonymity or privacy don't use them - you're better off not doing anything. With a private proxy network, which you connect via an encrypted tunnel at your disposal these are some of the benefits. You are completely anonymous from web sites, ISPs and anyone monitoring or logging you at work, home or school. You can bypass Geotargeting - where media sites like the BBC Iplayer, MTV or Hulu are restricted to a specific country. You can watch BBC anywhere indeed you can pick the country you appear to be from and watch anything. Also works to watch BBC News live. 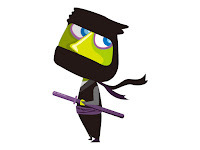 Never get blocked or barred from a forum or web site, your IP address can be changed with a click of a button, ninja style. Most of all protect and take control of your surfing, bypass logging and censorship and protect your data. If you are going to pick a ninja proxy for surfing make sure you know it's safe one, a vast number are virus riddled hacked boxes. Better still be a real internet ninja and try out the most advanced secure anonymous solution on the planet - Identity Cloaker , you can get access to a huge selection of super secure ninja proxies all over the world. I got an email about this post asking about how you could tell if a proxy is free. Well if you don't get asked for an account or password and the proxy works you can consider it free. Whether it is run as a honeypot, an identity thief, a misconfigured server inside a university is another question. My point of this post is if you value your security - don't use a free proxy you know nothing about, it's safer too use nothing believe me. Very informative article, well done! How does one go about deciding whether the proxy is safe to use in terms of your outlined security/privacy concerns? Thansk for the comment - this is a very good question and one which I will put up a post shortly to attempt to answer. There are certainly questions you can ask the owner/administrator to assess how secure a proxy is. One of the primary concerns I would have is regarding the logs, by using a proxy you are of course creating another list of your online activities. A well run anonymous proxy server would delete these logs immeadiately not retain them. But I will answer this very good question in full shortly !